The BDL168 manual states that 2 RX4's can be connected but it only shows how to connect one of them on Aux 2. How is the second RX4 connected? The RX4 is a 4 Zone Transponding Receiver Add-on for BDL16 series occupancy detectors. Each RX4 is made up of 4 RX1 sensors, a ribbon cable and a connector that lets you plug the unit into a BDL16-series detector. The earlier BDL16 and BDL162 occupancy detectors had the capacity for hosting one RX4. BDL16 & BDL162 boards are labeled with AUX1 & AUX2. 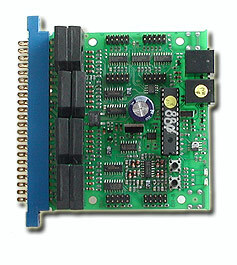 Only the AUX2 connection should be used for an RX4 with BDL16 and BDL162. The BDL168 is labeled with RX4-A (which corresponds in board location to AUX2) and RX4-B (which corresponds in board location with AUX1). Both RX4-A and RX4-B can host an RX4. 1. Plug two RX4s on to the RX4-B & RX4-A connections of the BDL168. Because of the high sensitivity level of the RX4 (and the earlier RX1) their placement relative to the zone common wires is important to avoid interference among the RX Transponder Detectors installed on the layout. Follow the spacing instructions carefully to be sure you have the best operation possible. 2. The BDL168 supports 16 detection sections, numbered 1-16. You can set up transponding for the detection sections in any way you choose. You can run one or more Detection Section wires through any of the RX1s. For example, you might have 8 transponding zones and 8 detection sections. Many combinations are possible to accomplish your goals.